Bella gloves offer serious thorn protection, cultivated with everyone in mind. 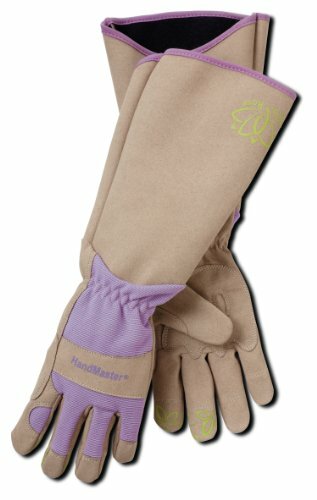 With a puncture-resistant, synthetic leather padded palm and reinforced fingertips, this rose glove provides what professional rose gardeners need most - strength, durability and comfort. The elbow-length gauntlet cuff protects forearms from cuts and scratches. A knuckle guard gives added protection from thorny plants. Whimsical printed floral fingertips add extra grip. Form-fitting spandex back for maximum comfort. Women's size large.